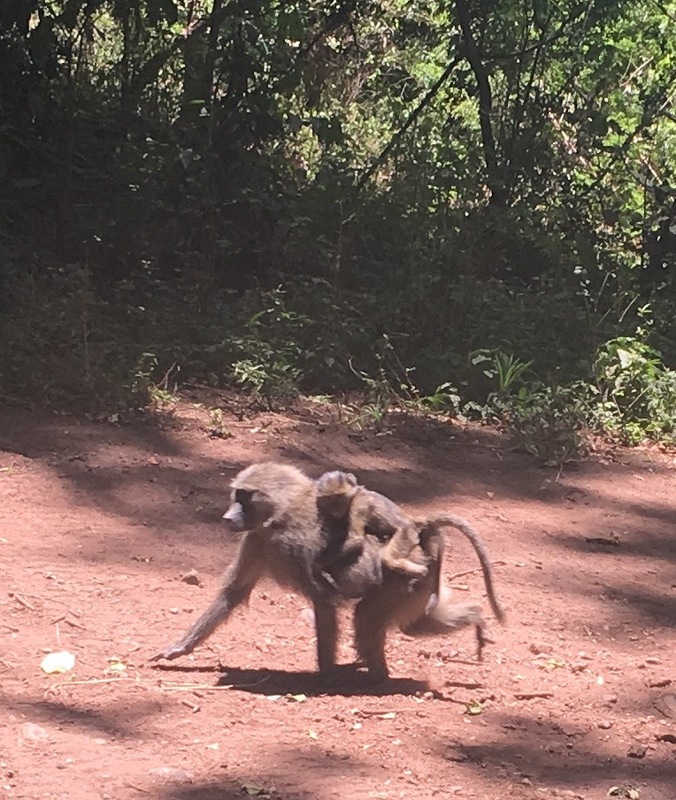 “Can I hold the baby?” A baboon offers her friend a helping hand so she can eat her stolen snack. We arrive in Arusha, at the foot of Mt Kilimanjaro in Tanzania after escaping showstorms in Boston and Amsterdam. It’s dark and steamy and blowing hot wind as 350 exhausted passengers make a break for it across the tarmac to the dubious-looking airport. We “line” up to pay $100 for a visa – there is only one bored/angry official assigned to the task. In adjoining cubicles, one person checks their phone, another watches soccer on a portable TV and a third eats dinner. The fancier the uniform, the bigger the epaulettes, the ruder the official — the smaller the country. More lines for picture taking and fingerprinting leave time to examine the airport – a warehouse with bundles of wires spilling out of holes poked in the low ceiling and industrial fans blasting hot air on the relatively good humored clusters of Europeans heading off in various safari directions. Then we’re standing outside in the sultry midnight with our rolling knapsacks and thankfully, a Nomad driver with our names is standing by. 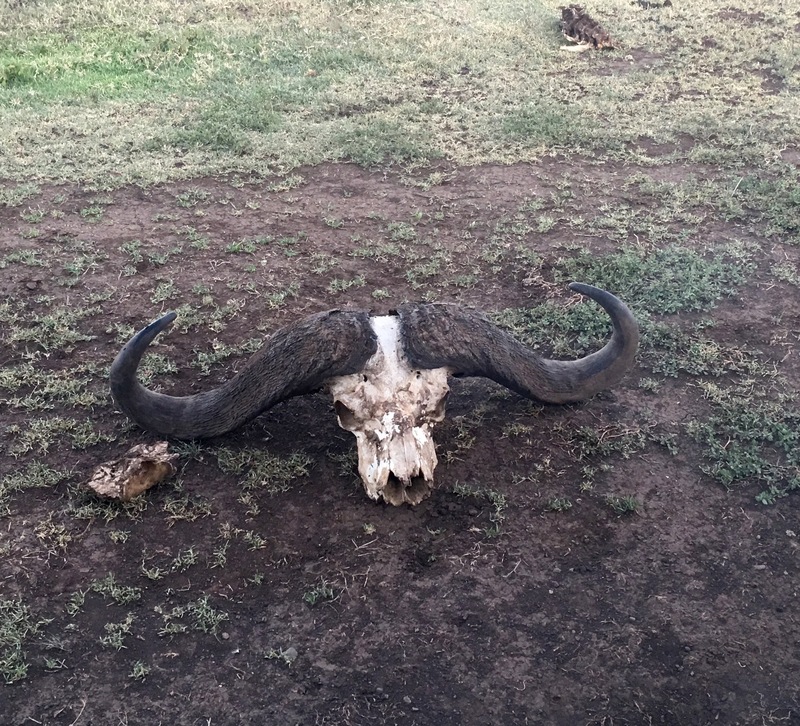 After an hour of driving in the dark (on the left) through fields, jungle, small towns, closed road-side shops, dogs, guys hanging out on a late Saturday night, we turn off and enter the gates to Machweo lodge where we are led to a thatched roof cottage with mosquito-netted bed. We try to figure out why our state-of-the-art iPhones won’t show the correct time zone, but give up and collapse. In the wee hours a nearby rooster and friends insist we get up and enjoy the view of Mt. 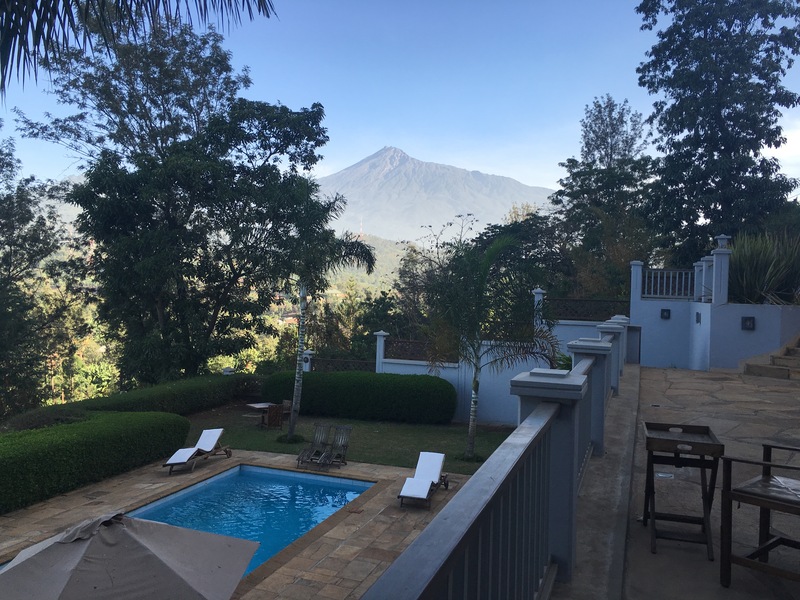 Meru – the second highest in Tanzania – and the air is clear and cool as the sun comes up. 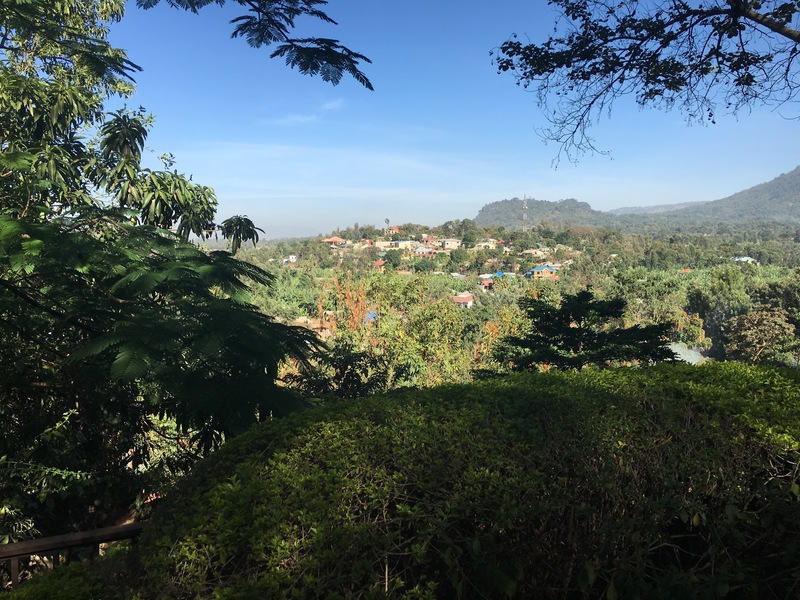 We meander through the lush grounds to breakfast where we chat with a few of the other stunned-looking tourists who have just arrived from 48 hours in airports. Philip, our Nomad guide for the next 7 days shows up and we like him immediately. Gentle sense of humor, self-confident. As I have already managed to break both my reading glasses and my sunglasses before even getting off the plane, we go through an OCD pat-down of our stuff: glasses, passport, malaria pills, adapters, (passport), phone, (passport) – and we’re off. 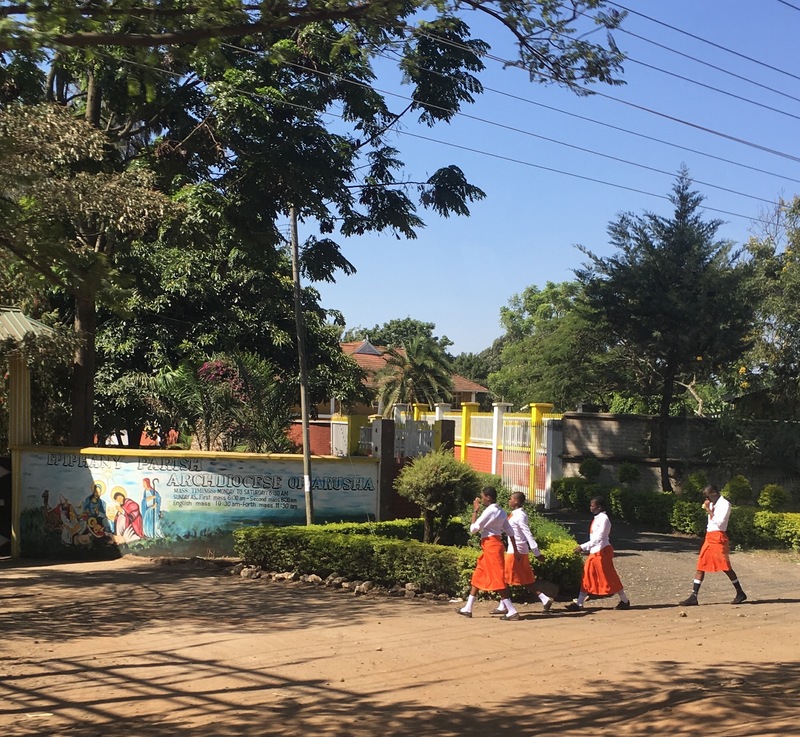 We drive out of the well-off outskirts of Arusha (“flush” with tourist money) on a Sunday AM and watch everyone parading in their church-going Sunday best – school uniforms and fabulous kangas in vibrant colors. Not a Muslim area, I’m guessing, although we pass several madrassas and black robed women as well. 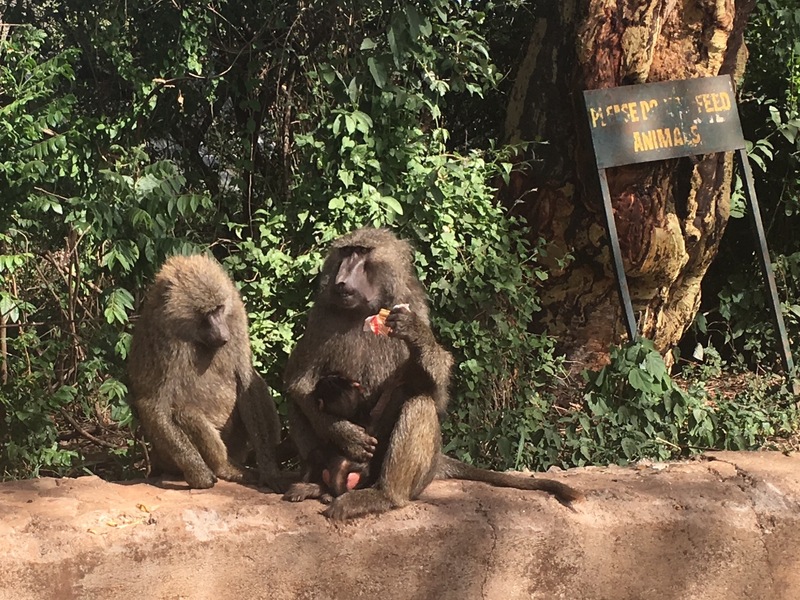 We’re heading to Lake Manyara National Park at the edge of the African Rift Valley (stretches from the Red Sea through East Africa to Mozambique.) 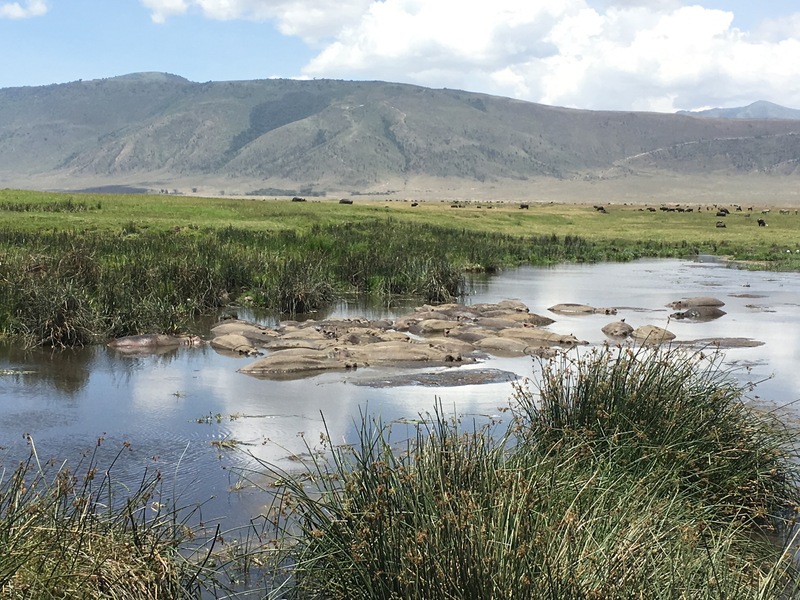 Manyara is one of the smaller parks – a few hours drive-through will do it, but exceptionally pretty and a wonderful introduction to local vegetation and wildlife. 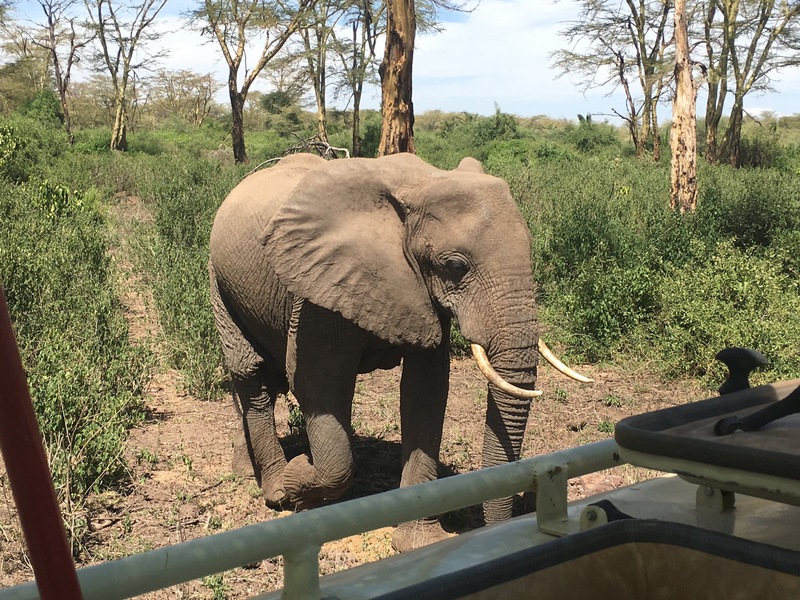 In fact, one our first encounters is with a group of 12 elephants who pass in front and behind us in magical (but initially terrifying – I confess – movement). 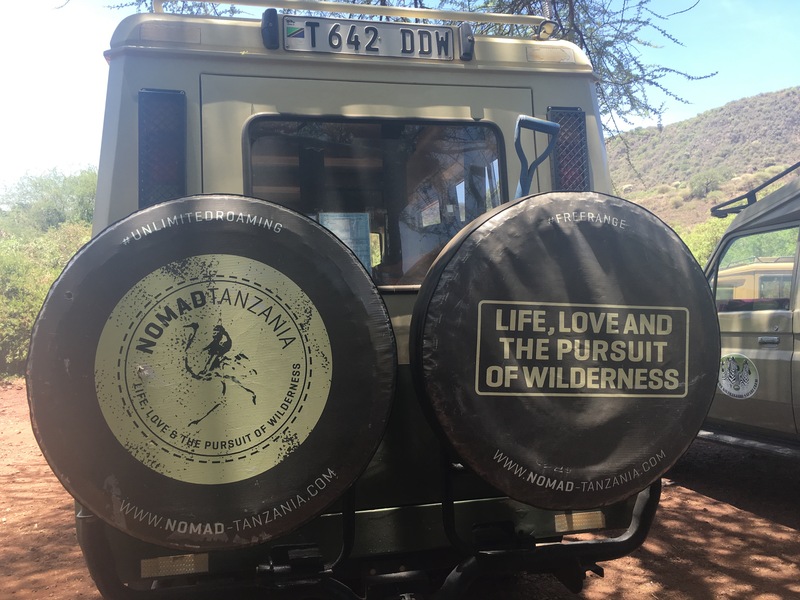 I have no idea how lucky we are; we have them all to ourselves – no short wave radios, no other land rovers. 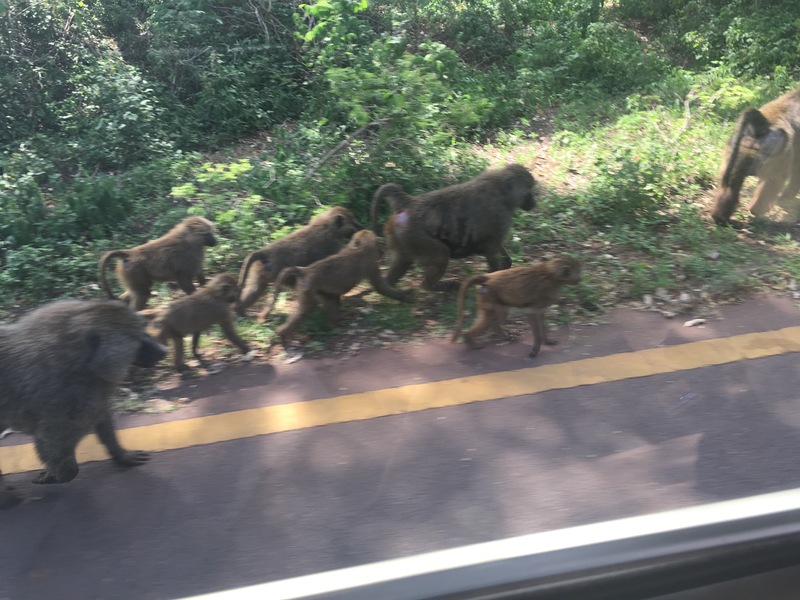 A “congress” of baboons runs alongside our jeep. We leave Lake Manyara – deeply shrunken by the long-lasting drought which has caused its distinctive flocks of pink flamingoes to head elsewhere – but thrilled that we have seen eagles, and hawks, blue-balled monkeys (really) more elephants, and tamarind trees and Baobab trees and hippos and cranes and Thompson gazelles and Cape Buffalo and – while no lions are in sight – many skeletal remains of various horned critters to confirm their predatory presence. Hippos like giant stepping stones. 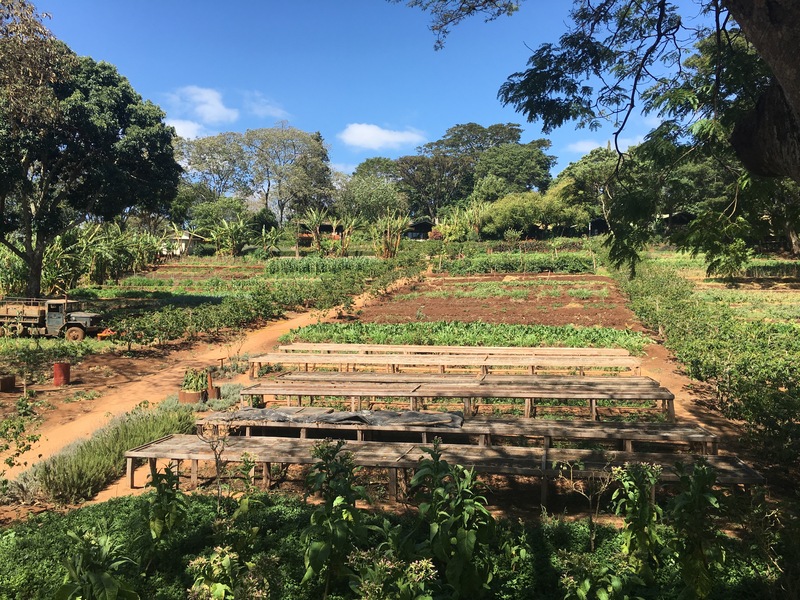 Then it’s off to Gibbs Farm through the town of Karatu and over red dust pockmarked roads to the oasis of this nearly 100 year old coffee plantation. 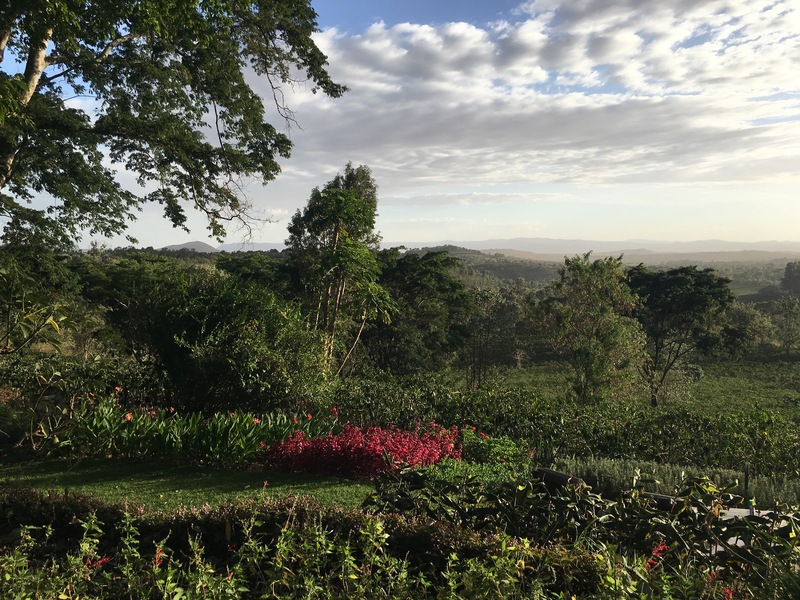 Our little cottage with its view over the working farm and signature flat-topped acacia trees is right out of a Masterpiece Theatre series on British East Africa. We are enchanted and oh-so ready for 16 hours of doing absolutely nothing. Over the hills and far away. Particularly beautiful with a gin and tonic. Farm to table at Gibbs. And delicious.